In the spirit of “make some art everyday, if only for ten minutes,” today I took a short break from gardening to do a little silk screening — on the front of my newest beehive. This hive has been with me for a few weeks now and still didn’t have a name. I’ve called them “the nuc” (short for nucleus, which is a small colony with a laying queen) or “Pipsqueak,” which seemed rather insulting given their robustness. A normal artist would have worn a veil; a normal beekeeper would have painted designs on the hives before filling them with bees! 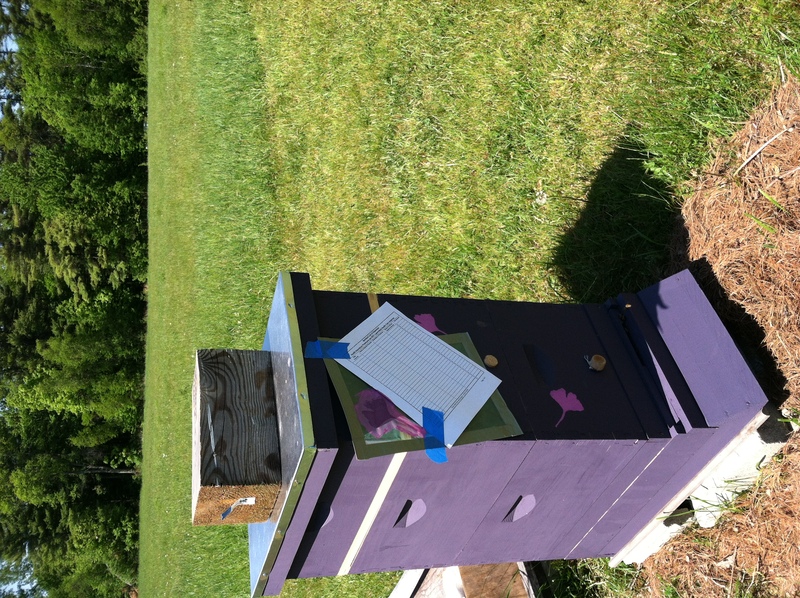 But the day was bright and sunny, and my new bees are fairly gentle. Actually, they were more concerned about doing their jobs than pestering some artist trying to keep a flimsy thermofax screen taut in the afternoon breeze. I hope that the bees from Ginkgo enjoy their newly decorated home!